The .22-.45 Pistol Cleaning System is the perfect kit for to clean .22 caliber through .45 caliber pistols. Now automatics can be cleaned correctly, from Breech-to-Muzzle, without disassembly. 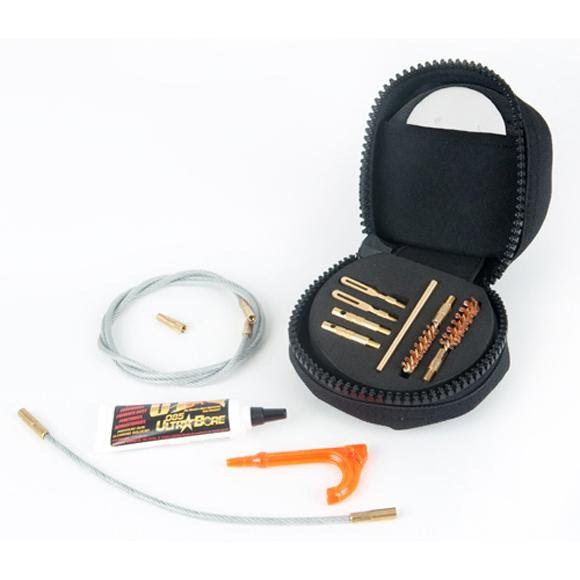 This pistol cleaning system comes with a .20 caliber & a .30 caliber solid brass slotted tip, a .20 caliber & a . The .22-.45 Pistol Cleaning System is the perfect kit for to clean .22 caliber through .45 caliber pistols. Now automatics can be cleaned correctly, from Breech-to-Muzzle, without disassembly. This pistol cleaning system comes with a .20 caliber & a .30 caliber solid brass slotted tip, a .20 caliber & a .30 caliber obstruction remover; which can be used to clean obstructions out of the bore, a t-handle bar for added comfort while pulling the flexible rod through the barrel, and a bore reflector/flag safety. This kit would not be complete without the .5oz. tube of Otis O85 Ultra Bore Solvent, and the .38 & .45 caliber bore brushes.